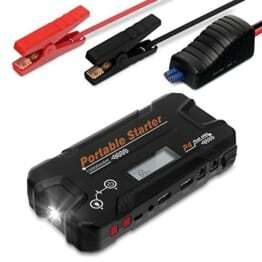 Compact and portable, the SL65 is great for emergency jump starts and charging mobile devices. 8,000mAh of lithium ion power keeps you prepared for emergencies. The smart cable provides added protection. Enjoy any adventure without worrying about battery life. Schumacher’s Red Fuel 8000mAh Lithium Ion Jump Starter and Mobile Power Pack is ideal to use for an emergency jump start and also for charging portable electronics. The 8000 mAh lithium ion battery provides longer life and more charge cycles, with 2X faster charging for all USB devices, including smartphones, mp3 players, and tablets. 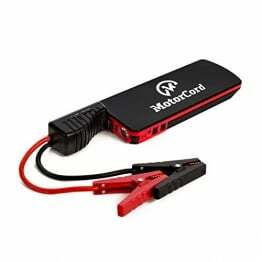 This device also quickly jump starts vehicles, and works great for power sports, motorcycles, and 4-6 cylinder cars, with up to 20 jump starts per charge. The ultra-safe smart cable protects against reverse polarity, short circuit, low voltage, high temperature, and reverse charging. Features 2.1A and 1A USB ports and a built-in LED light. Contents: (1) SL65 Jump Starter, (1) AC adapter, (1) smart cable/clamp set, (1) travel bag, (1) user manual.